From a small shop in his garage to a store front on Route 302, Chris McDonald has taken his business, Windham Powersports, to another level through persistence and vision. He opened first, out of his house, then in a location close to the Raymond town line, in 2014. There, he did a lot of repairs, began selling youth ATV’s and snowmobiles and worked tirelessly on building a name for the business. September 1, he opened the new location at 646 Roosevelt Trail across from Mechanic Savings Bank. junior sized and three-quarter sized four wheelers, snowmobiles and accessories like helmets, gloves and goggles. One new item is the top of the line hover-boards, with eight-inch wheels, colorful lights and Bluetooth capabilities. “We are bringing the level of quality up,” McDonald said. In the store, customers can see the new Apollo Volts, electric 4-wheelers with 500-watt engine and parental controls that can adjust the speed to 5, 10 or 15 mph. “These are real 4-wheelers made from metal, by no means are they anything like the typical Power Wheels you find at big box stores,” said McDonald. Check out the Ice Bear Mad Dog scooter, which sounds like and cruises like a Harley with flashy chrome and at half the price of a Honda scooter proves you can look good and save money. A basic scooter that they carry can “save a ton of money on gas and travel up to 40 mph depending on the weight of the rider,” McDonald said. The shop also offers a variety of dirt bikes from 70 cc to 250 cc, which parents can ride also. Full-sized machines are available for special order, including side-by-sides for adults and kids. In addition to the new items, Windham Powersports is also selling used 4-wheelers and snow machines. Snowmobiles are coming in, and Windham Powersports has the machines for kids to enjoy the trails with Mom and Dad. The 170-cc engine, three quarter sized sleds are good for all. With the steering capabilities and forward and reverse modes, the kiddos can ride with the adults on the trails. It can carry up to 320 pounds and is not over powering to control. They are also a perfect utility machine for adults. Brand new, Windham Powersports is selling them for $2,899, which is a $400 savings. Stop in to see the videos of the snow machines racing and tackling hills. The most popular items are the Little Tumbleweed 4-wheelers that come in a variety of colors. “We have every part for any Chinese machine people are looking for,” he added. With parts, glasses, VP racing cans and so much more, there’s no reason not to stop in. Now there is no longer a need to wait for financing either. Windham Powersports offers in-house financing from NextEp, which offers payment plans set up through a private application process online through the Windham Powersports website or in-store. From $500 to $5,000, customers can be pre-approved in minutes. The loan covers machines and accessories like gloves and helmets all in one package. There are also early buyout options. At the new location, there are extra bays for working on machines. 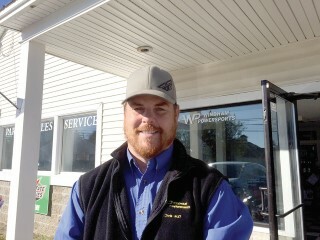 Windham Powersports is the most affordable service shop in the area, said McDonald. “We still work on everything. We take consignment and trade ins. We give fair value toward buying a new machine,” he added. They also still offer drop off and pick up service in Windham. This is just one example of how their customer service sets them apart from their competition. Windham Powersports will hold a grand opening celebration on October 17th starting with a ribbon cutting at 8:30 a.m. and then a BBQ from 12 p.m. to 2 p.m. with The Wolf radio station there to give away concert tickets. 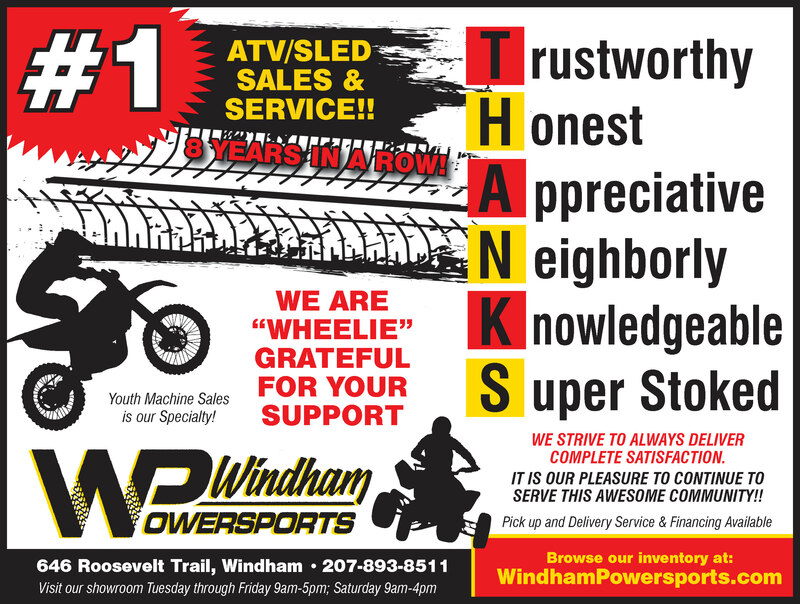 For more information, visit www.windhampowersports.com, call 207-893-8511, or find them on Facebook, Instagram, Twitter or email service@windhampowersports.com. There is a digital catalog on the website.